Our stories and relationships in our community. 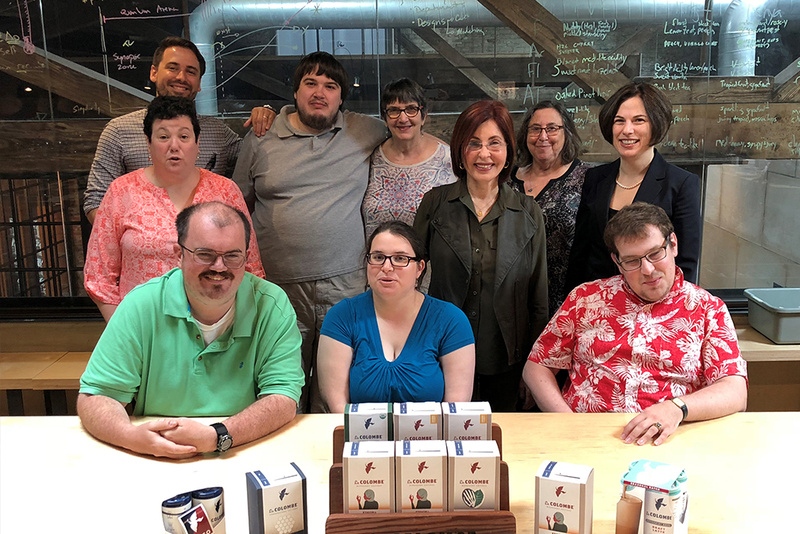 Philadelphia-based coffee roaster will partner with the JCHAI member-run coffee shop at the new John and Jacqueline E. Swartz Education Center to help their mission of teaching adults with developmental disabilities, including autism, the skills needed to run a business. Bryn Mawr, PA, June 5, 2018 – Judith Creed Horizons for Achieving Independence (JCHAI), an organization that empowers disabled adults to live and work independently, today announced that Philadelphia-based coffee roaster, La Colombe, will partner with the JCHAI member-run training coffee shop at the new John and Jacqueline E. Swartz Education Center. Under this partnership, La Colombe will provide coffee, equipment and maintenance, as well as teach JCHAI members the skills needed to run a coffee shop successfully. The new coffee shop will house state-of-the-art equipment, including a FETCO brewing system, a MAZZER Super Jolly Electronic grinder and a La Spaziale espresso machine, and will serve Corsica, Nizza and Monte Carlo coffee blends. JCHAI members will receive extensive training from La Colombe staff on a variety of topics, including coffee brewing techniques, maintenance of the coffee station, as well as barista skill consistency to ensure JCHAI members brew coffee to La Colombe standards of quality and excellence. “At La Colombe, we’re passionate about coffee and making a difference in the community, so it’s an absolute honor for us to partner with Judith and the JCHAI team and pass on our knowledge about how to do coffee right,” said Matt Sunderland, VP Wholesale Operations. With JCHAI’s 70 percent employment placement, compared to the national average of approximately 30 percent for adults with disabilities, this coffee shop will provide a unique vocational training opportunity for JCHAI members. The coffee shop is expected to open in early 2019. For more information on JCHAI and its services, please visit www.jchai.org. Founded in 1987, Judith Creed Horizons for Achieving Independence (JCHAI) empowers adults with developmental disabilities including autism to live and work independently in the community. Through educational, vocational, social and supported living services, JCHAI’s experienced staff help create an inclusive environment where adults with disabilities can learn, have fun and live up to their potential. To learn more about JCHAI’s programs and offerings, please visit www.jchai.org or check us out on social on Facebook or Twitter. La Colombe (www.lacolombe.com) is a leading coffee roaster known for ethical, long-term trade practices with growers. Considered one of the pioneers of the third wave of coffee, it provides signature classic blends and exceptional single-origin coffees to cafés, hotels, restaurants and retailers around the world. In addition, the company owns and operates 30 cafés in Philadelphia, New York, Chicago, Boston, Los Angeles and Washington, D.C. – with additional locations and new markets scheduled to open in 2018. The company has also made headlines in the ready-to-drink business with its DRAFT LATTE – the world’s first-ever textured cold latte. Worker with developmental disabilities celebrates 12 years on job at Villanova. Help support and fund JCHAI’s programs by donating today! All contributions will be restricted to be used for expenses for which government funds are not available.